Text from the Wiltshire SMR summary. For more recent information see Bluestonehenge, Oval or Round? Late Neolithic to Early Bronze Age single entrance henge first identified as such from cropmarks on aerial photographs. Subsequently excavated in 1926. 1970 and again in 2006. A) Class I henge comprising broad ditch, berm, external bank with NE entrance, 6 concentric rings of postholes in interior and a child’s grave off centre. B) Excavation in 1926-8, & 1970 produced grooved ware assemblage & C14 dates 1867+/-74, 1805+/-54bc. C) A geophysical survey conducted during 2004 located the northern entrance terminals of the Woodhenge ditch as broad positive anomalies 8m wide incorporating some more strongly magnetic ferrous responses probably linked with Maud Cunnington’s excavation of the ditch terminals and causeway in the 1920s. A series of very weak and localised positive anomalies are present in the area of the entrance causeway across the ditch and gap in the bank. They may represent small pits associated with the henge entrance although they do not appear to agree with the positions of post-holes in the entrance area recorded in Cunnington’s report. It is possible that these anomalies may be the artefacts of earlier excavations. D) Re-excavation of Maud Cunnington’s 1926 excavation in 2005-6 revealed a group of three new stone holes to add to the two found by her. Whilst Cunnington discovered that Woodhenge’s timbers were replaced by a smaller rectilinear arrangement of standing stones, the new discoveries reveal that there were two phases to this replacement in stone and the stones formed a three-sided ‘cove’ similar to that at Avebury. The first phase was an arc of at least four small stones open to the west; those stones were then removed and replaced by two, much larger, sarsen settings represented by stone-holes ‘h’ and ‘I’. Excavation under the Woodhenge bank uncovered a tree throw hole into which had been deposited sherds of Carinated Bowl pottery dating to the beginning of the Neolithic ‘c’ period 4000-3800 BC. A Geoarchaeological study afforded the chance to sample the surviving palaeosol beneath the bank and immediately adjacent to the area investigated by Wainwright and Evans (1979). The buried soil profile beneath the bank is a very thin rendzina with variable presence/absence of a turf line. This soil evidence confirms the snail evidence of a long established grassland environment by the 3rd millenium BC. 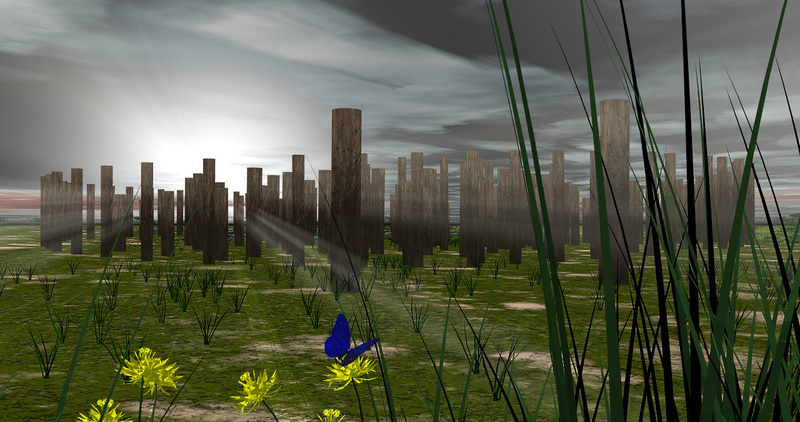 The musician Tubular Tos used the model in the artwork for his composition ‘Woodhenge 2012‘. And it’s rather good. . .